Lake Powell Boat and Jet Ski Rentals offers the largest selection of luxury wakeboard and water ski boat rentals from Mastercraft in Lake Powell. Offering eight different models of competition boat rentals allows you to choose the best boat for your groups size and needs. 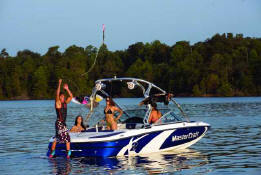 The Mastercraft X-Series boats are versatile for Lake Powell?s water conditions, cruising, and water sports activities. Enjoy vacationing at Lake Powell with new jet ski rentals from Yamaha with two model to choose from including; the Yamaha 1100cc VX Deluxe three passenger machine, and the Yamaha 1812cc super charged FX Sho three seater. Our waverunners, PWC?s, and Sea-doo rentals are new, dependable, and well maintained to give you a worry free houseboating trip. We also offer private group lake tours, jet ski tours, water sport lessons, and guided charters at Lake Powell for those who want a professional captain to drive the watercraft. You can enjoy the Glen Canyon Dam, Rainbow Bridge, wakeboarding, water skiiing, sightseeing, kneeboarding, wake surfing, wake skating, air chair, and tubing all part of one chartered service. Lake Powell Boat Rentals has specialized services to help with all customer requests. Our watercraft rental and charter services extend to all marinas in Page, AZ and Lake Powell, UT including; Wahweap Marina, Antelope Point Marina, Bullfrog Marina, Hite Marina, Dangling Rope Marina, and Halls Crossing Marina. We are your total water sport outfitter at Lake Powell. ?